Extremely small particles of pollution have the potential to evade the lungs’ protective filter system and end up deep in the body, scientists suggest. Researchers speculate the particles could then build up in blood vessels and raise the risk of heart disease. They say their early study – based on extremely small particles of gold – brings them a step closer to cracking the “mystery” of how air pollution and heart disease and stroke are linked. The work appears in ACS Nano. 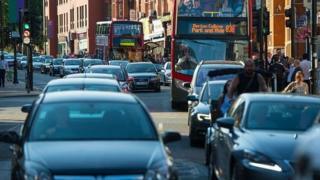 Air pollution is estimated to help shorten of the lives of about 40,000 people a year in the UK. Several studies suggest it does this in the most part by worsening or triggering heart or lung problems. But despite many theories, exactly how air pollution affects the heart is not fully understood. Some scientists suspect that it may be partly down to extremely tiny pollution particles (known as nanoparticles) that could potentially be too small to be removed by the body’s filter system in the nose and lungs. To investigate researchers, from the University of Edinburgh and universities in the Netherlands studied extremely small particles of inert gold – at a similar size to those found in diesel exhaust fumes. Scientists asked 14 healthy volunteers to breathe in air containing pieces of gold, which scientists consider inert, while exercising for two hours. A day later, researchers found that gold nanoparticles had made their way into the bloodstream of most participants. And for some people, the particles remained in the body for months – they were detected in people’s urine three months later. A week of coverage by BBC News looking at ways to cut air pollution. Scientists suggest this shows that nanoparticles of pollution have the potential to make a similar journey into the body. Dr Nicholas Mills, co-author of the work, said: “We have always suspected that nanoparticles in the air that we breathe in could escape from the lungs and enter the body, but until now there was no proof. In another similar experiment, researchers asked three patients with clogged-up blood vessels to breathe in air containing tiny gold nanoparticles. A day later, when the patients had part of their damaged blood vessels surgically removed, there was evidence of this gold building up in the diseased parts of vessels. Researchers speculate that by accumulating in vulnerable areas of the body air pollution particles could worsen heart disease and stroke. Dr Zongbo Shi, at the University of Birmingham, said: “This is a well designed and high quality study, and the results unequivocally showed that nanoparticles can travel from lungs to blood vessels and different organs. But Prof Peter Dobson, at the University of Oxford, argues the study has a number of pitfalls, including the fact that gold does not match the chemistry of particles present in pollution. Meanwhile Prof Jeremy Pearson, at the British Heart Foundation, which part-funded the study, said there was no doubt that air pollution was a killer that needed to be taken seriously. But he cautioned more research was still needed to pin down the mechanism involved and firm up the evidence.